We all love the luxury of going to a spa or salon and being pampered, but with prices ranging from $50 to well over $100, these are treats most of us can’t afford very often. That’s a real shame, because regular facials are needed to keep us looking our best. 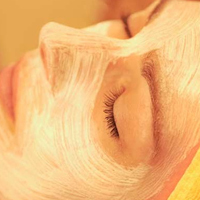 We should all be doing a basic facial every two weeks, with a more thorough treatment every four to six weeks. Doing a facial at home is easier than it sounds, will save you a TON of money, and will keep your face looking younger longer. Remove any makeup you may be wearing that requires a makeup remover and wash your face thoroughly using a cleanser appropriate for your skin type. Rinse well. Use your exfoliant, avoiding the delicate area around the eyes, and using gentle circular movements to remove dead skin cells. This process should take about 5 to 10 minutes. If you chose to prepare a tea; place a towel over your pillow, strain the herbs out of the tea, soak a clean washcloth in it and wring out the excess (leave it wet, but not dripping.) Lie down and spread the warm cloth over your face, leaving it until it cools. Apply your mask and lie down and relax for the time specified in the directions. Rinse thoroughly with cool water to close the pores, and follow with your astringent. Moisturize and use your eye cream or lotion. Now I imagine you want to know some recipes? Well you’re in luck, click the link and check out my top five best homemade face masks. Or, alternatively, check out my two avocado face mask recipes.